For the last five years I have had the enviable job of helping to protect our bathing waters in the beautiful northern reaches of North Yorkshire. There are not many better days than a sunny day out and about visiting and protecting the beaches at Sandsend, Staithes, Runswick Bay and Robin Hood's Bay. All these beaches have rivers running into them. Before reaching the sea, the rivers and streams pass through agricultural land and have the potential to take bacteria originating from animal slurries and manures down to the water at the beach. I have been working with the farmers in the area to help raise their awareness of the potential impact their activities could have, polluting rivers and ultimately reducing water quality at the bathing waters downstream. Specific activities I look out for include; livestock access to watercourses, poor practice when spreading slurries and manures, run-off from areas where livestock gather and dirty water run-off from farmyards. Walking across the catchment gives me a good indication of the nature of the risks in the catchment, and a better understanding of the types and nature of the farms and the kind of issues I may need to address with the farmers. Unfortunately, the best time for me to do this is during heavy rain when run-off from the land is at its peak. It’s lucky that the Environment Agency provides me with good waterproofs! Before going onto the farms, I introduce myself to the farmers via a newsletter and this is then followed up with an evening meeting. Colleagues from North York Moors National Park Authority and ‘Catchment Sensitive Farming’ - a joint Natural England and Environment Agency project - lend their support at these meetings. We work closely together to help identify how we can get the best result for the environment. We may undertake joint visits to see a farmer to listen and provide consistent advice about which improvements achieve the best effect for the environment and bathing water. Sandsend beach is near to Whitby and is popular with tourists but water quality needed to improve to ensure the beach will do well in the tough new tests coming in from 2015. Investigations found that pollution was coming from a number of sources including agriculture. So we ran a project in the Sandsend catchment whereby farmers were able to apply for funding for materials to address potential issues. 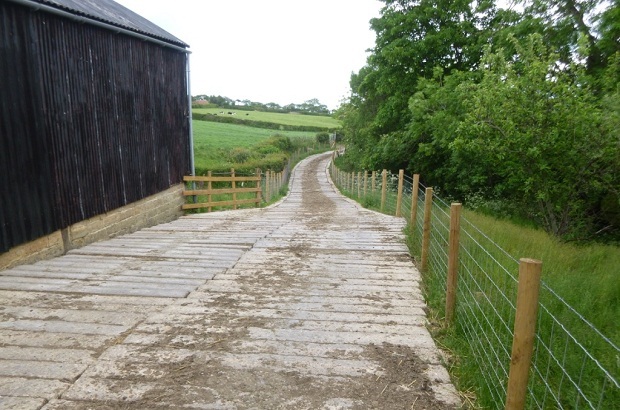 Twelve farms were successful and have since received materials such as watercourse fencing, concrete railway sleepers which are laid on the ground to provide a hard track, drinking troughs, drainage pipes and guttering. The farmers have installed the materials themselves and carried out other works we had agreed to improve their sites. There have been lots of success stories, improvements that have had real benefits for farmers. One example is in the before and after photos shown. 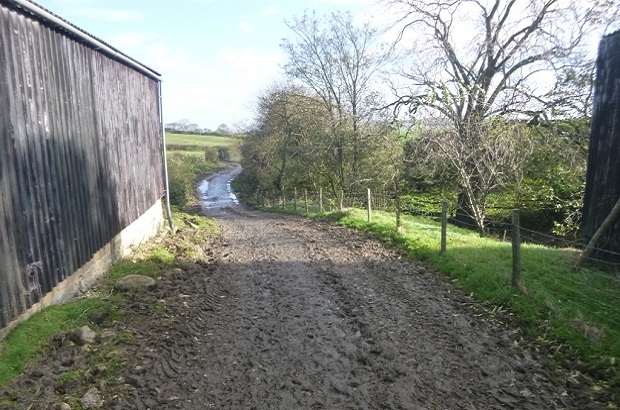 The dairy herd at the farm were using a rough track close to a watercourse to come to and from the milking parlour twice a day, in wet weather this became deep in mud and slurry. This had the potential to cause pollution by running off into the stream and also the bacteria in such wet areas can cause impacts on the health and productivity of the cows. By installing a new hard track and fencing, the cows are now able to make the journey on a cleaner track, improving their health and productivity and also protecting the quality of the watercourse. Running projects like this where we can help farmers address the risks they pose to the environment is a new way of working for me. It has allowed for more open discussions with farmers as to their potential risks. It also allows me to look at things in a more practical way on farm or in the field and we often come up with solutions together, which is great. Projects like these have been run up and down the country and have proved to be really successful, not only in the steps taken to protect our bathing waters, but they have also helped influence a new win-win approach. I look forward to sharing this way of working with others and continuing to develop innovative ways of working with farmers. Great article when we know that nitrogen river pollution main source is agricultural activities on river banks. Among the solutions that can be used to contain pollution described in this article, there is also grass strips on the rivers banks which will catch pollutants during run-off and has proven efficiency in many countries.